Central India is an alluring place. Not for its vast tracts of impenetrable forests, not for the Gond tribals who make fantastic art , but for the whispered war playing out in its arena. It’s a war between the State and its many arms, against a few shadowy figures in fatigues who proclaim to stand for the people. This, dear readers, is not a war of words. This is a war of gruesome discontent, of vengeance and does not have a happy ending. The Maoist movement in India has been a long time object of commentary in mainstream discourse. Politically as well as ideologically, it has often either been elevated – for its emancipation of the landless peasants in central India, or slammed – for its violent nature. The movement firmly pitches the State as the imperialistic overlord which must be overthrown. The State is seen as being repressive, colonial and serving only the rich. The poor and the landless must throw off the yokels of victimization and rise up against the State. The Maoist guerrillas, educated, idealistic and fiery, are the ones who will facilitate this uprising. It is this, rather simplistic, view of the movement which is presented in Rahul Pandita’s ‘Hello Bastar.’ Pandita presents a highly sympathetic perspective of the Maoist movement in India. Drawing on significant field experience and extensive research, he constructs an elaborate narrative of the movement. He builds on the movement’s history, the personal histories of the top leadership, and describing the evolution of the movement to its current form with possible trajectories in the future. From the appearance and the style of writing, Pandita has made an honest effort to distil the movement down in order to reach a wider (and presumably urban, middle class) audience. While this is refreshing, considering the tomes of academic material that is being published on the Maoist movement inIndia, Pandita’s writing does tend to get a bit sloppy with certain insinuations randomly inserted into paragraphs unexplained. Sometimes, the book reads like an almanac of Maoist names without much information about who they are or where they came from. While this contributes to the shadowy nature of the movement, it tends to leave the reader a bit frustrated (and then bored!). So what did I like about the book? It reads like a thriller; unlikely and infamous ‘heroes,’ thick forests, innocent and deprived tribal ‘victims,’ the villainous State and the violence! Let’s not forget the violence. Like I said earlier, this makes a refreshing change from the tonnes of academic material being produced regularly on the movement. In addition, Pandita explores the lives and times of several Maoist leaders with a sensitivity and compassion. He puts a human face to the movement which I think has been sorely lacking in mainstream discourse. Unfortunately, that’s where my appreciation for the book ends. To a large extent it comes across as a piece of Maoist propaganda literature! 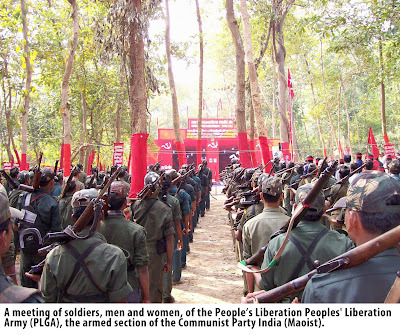 The Maoists are posited directly on the side of the people. While this is not exactly the issue (I personally believe to some extent in their cause as well! ), Pandita inexplicably forgives Maoist violence at almost every level. While State violence is condemned repeatedly (and deservedly), Maoist violence is often excused or skimmed over, while their ‘development’ work is emphasised and bolded. Violence can never be excused, even if it is seen as a part of the revolution. To my mind, this is where the Maoist movement has indeed failed and one of the reasons why it is seen with much revulsion. While Pandita has obviously set out to change this perception, the lack of acknowledgement of this issue rankled. Secondly, frankly I expected a far more critical account of the movement. This is of course a personal expectation but nevertheless I was disappointed by the lack of this. Pandita has presented a very one-sided narrative here, rich as it is. I wish to have read more about civilian reactions such as the Salwa Judum movement (which he barely touched, despite the book being called ‘Hello Bastar’) I wish to have read more about the State perspective. Several actors have been neglected in the telling of this story and I wish to know about them as well. To my disappointment, it fails to facilitate any sort of debate, or dialogue on the movement. When the aim is to rouse public consciousness, this is perhaps unpardonable on the part of the book. Lastly, and perhaps infinitely more worrying, is the depiction of tribal people in the book. While talking about any community, it is the responsibility of the author to report with sensitivity and thought. The tribals in the book were reduced to mere victims, unable to take control and change their lives. The Maoists are depicted as their ‘saviours.’ The Maoists, many of them, are college educated and to a large extent from urban centres. A lot of attention has been given to how the Maoists bought education to the tribals, are creating curriculum in Gondi (a language with no script) and spreading the Maoist word among the people. My question is this – if the Maoists were to withdraw from the jungles today, will the tribals ever come out on their own and demand their rights? Will they willingly embrace violence and war to ensure this happens? The Maoist movement, the way I see it, is NOT an emancipatory one, however much propaganda (and this book) might claim it to be so. While it arose out of severe deprivation and the lack of any kind of meaningful State intervention, it advocates for an unsustainable form of governance and this is a major gap that Pandita’s book fails to address. However, to his credit, no book can cover all its bases. I perhaps expected more from the author considering his significant journalistic background and experience in this area. I wished for something far more nuanced. I will however give it this: it’s a good place to start reading about the Maoist movement. But a sincere request from one reader to another, particularly if this is the first time you are encountering the ideology and the movement: Don’t stop here. There’s much much more to the movement than what’s presented here. This book serves a workable introduction but just like Wikipedia, do not take it as the be all and end all of the Maoist movement in India.